Please refer to this link for her information at Waring-Sullivan funeral home. The City of Fall River was awarded Tree City USA by the Abor Day Foundation for the 11th year! FRSTPP has recently been notified by city grant writer Jane DiBiasio that Fall River has received national recognition as a Tree City by Tree City USA for the 10th straight year. A Growth Award for the 4fth consecutive year was also achieved. Free trees available. Call the Department of Conservation and Recreation, Greening the Gateway Cities Tree Planting Program at (617) 997-1795 to schedule a free site visit with our forestry team. Trees may help beautify your property, increase wildlife habitat, create more shade or gain more privacy. The City has purchased a water tank to assist with the watering of City trees. It is attached to a trailer located at Community Maintenance Garage Lewiston Street and will be available to volunteers who have a truck or SUV with a hitch and are willing to help water newly planted trees. The tank will be filled with water and ready to go. City staff will orient volunteers to the equipment. Capacity of the tank is 350 gallons but will only be filled to the 150 gallon level. Please consider helping once or twice a month. Estimated lenght of time is 1.5 hours. Notify Mary Ann Wordell or Brian Pavao at DPW-Lewiston Street if you would like to volunteer. Great job by tree stewards, volunteers who planted the trees and city employees who pre-dug holes, delivered the trees and mulch to the sites plus completed clean up. Appreciate the efforts of all!!!!! 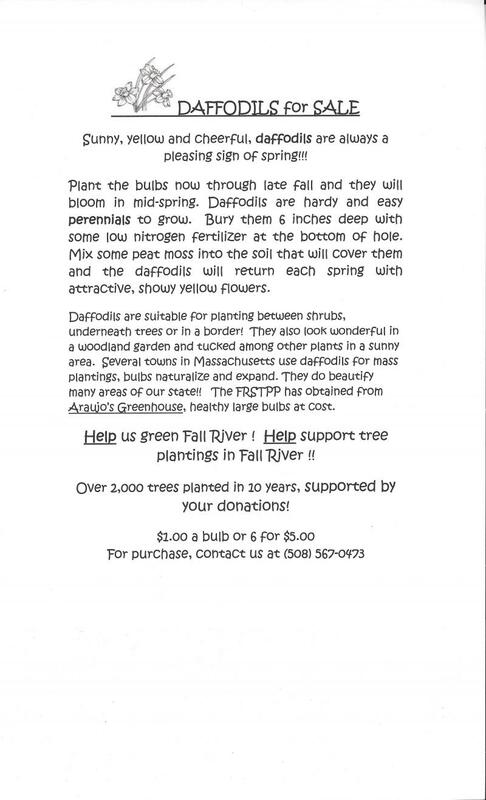 To help us raise funds for the Fall River Street Tree Planting Program, Domino's Pizza cards will be available starting June 1st. Each card is only $10.00 and can be used 16 times. Each time you use a card to buy a pizza, you'll get a second pizza of the same value or less for free! Cards will be available from FRSTPP members and at New Boston Bakery at 279 New Boston Rd. The cards are valid for one year and can be used only for take-out service at participating Domino's businesses. Each year, over, 1,500 Ma. Fifth graders participate in the Arbor Day Poster Contest. The winners reap rewards including art supplies, ice cream, and a tree for their school. Deadline: April 1, 2016. The Fall River Street Tree Planting Program mourns the loss of Mary Ann Wordell, its founder and, until very recently, President. Her devotion to and impact on trees in Fall River was monumental. She was truly a "force of nature" in the very best sense.